This baked cauliflower is an easy 5-ingredient recipe. The cauliflower is baked to perfection with a simple butter and bread crumb coating and Parmesan cheese topping. This casserole may be made with a combination of cauliflower and broccoli florets as well. Add more Parmesan cheese or use Romano or Asiago cheese for sharper flavor. Wash and break the cauliflower into florets. Place the cauliflower florets in the top of a double boiler or heat-safe colander over simmering water and steam, covered, for ten minutes, or cover with water and cook until just tender. While the cauliflower is cooking, melt the butter or margarine, add the bread crumbs, and stir until lightly browned. Drain the flowerets and dip them in the hot bread mixture covering each completely. Place the cauliflower in the prepared baking dish and sprinkle any remaining bread crumb mixture over the cauliflower. Sprinkle with salt and freshly ground black pepper. Sprinkle with parsley, if using, and Parmesan cheese. Bake the cauliflower casserole in the preheated oven for about 20 to 25 minutes. 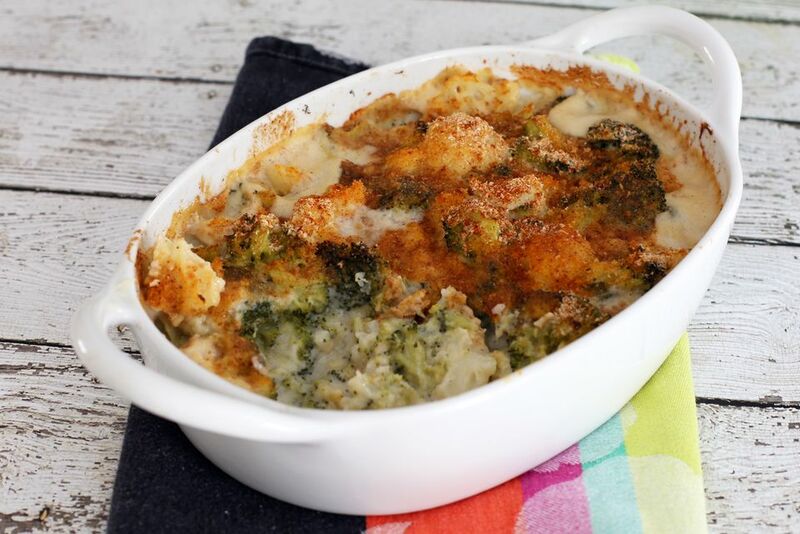 Make the casserole with a combination of broccoli and cauliflower florets. Replace the Parmesan with another kind of grated or shredded cheese.